Marcus Wheelhouse Tips | WEEKEND HANDICAP | Make your game better and prove it! 1, is that the path of the clubhead approaching the ball is in the wrong position i.e. cutting across the shot. 2, the clubface is reacting to that out to in path. or b) when the clubface squares to the path of the club and the golfer gets a pull shot! I call it the slices angry brother! Here is a simple drill to use with your tour sticks. (You can buy these at most golf shops if you need them. They are useful for many different drills). This will help to improve your path into the ball and teach your arms and body what it is meant to do. Place a ball down and insert a tour stick(s) 4 inches outside the target line as pictured. Have the stick(s) on an angle that would dissect your neck, this is about 55-60 degrees for me, it will vary with your height (use a mate to help you or improvise). Now you have an idea of your path into the ball – remember it is a guide it doesn’t have to be precise. 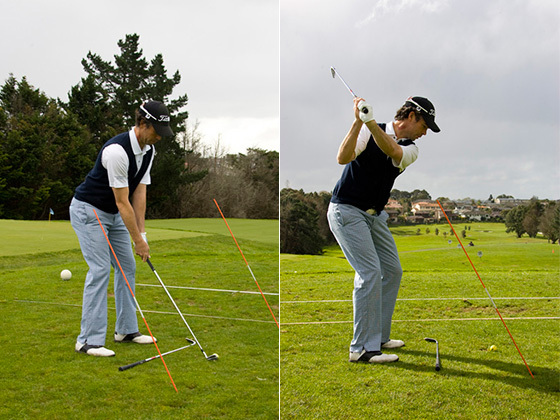 This will work not only for your backswing but also more importantly for your path into the shot. 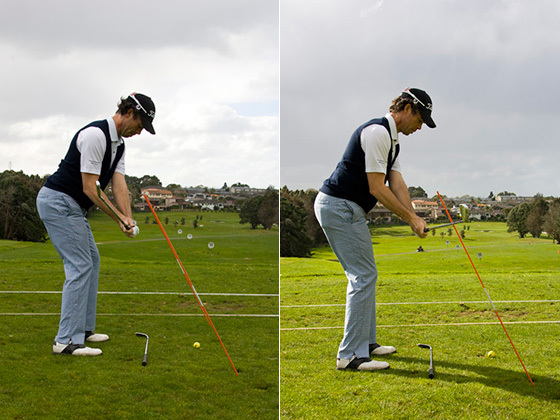 If your swing path alters too much you will collect the tour stick and you will certainly know about it. If you are a serial slicer your shot should still go right at first, but the ball will start more online to the target. This is your first step to curing your slice. The clubface will start to adjust after a consistent approach to the impact area is established. In a future issue I will talk about the release of the club so get practicing and I will have you cured before you know it! Marcus Wheelhouse was ranked number one in the world as an amateur and is a former touring golf pro. He is now a teaching professional at JK’s World of Golf. If you’re in Auckland book a lesson with Marcus. He loves coaching and developing golfers of all levels.